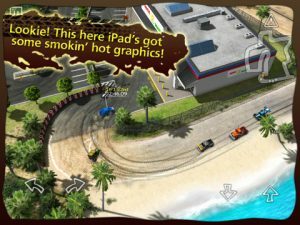 One of the most impressive looking games I’ve played in some time, Reckless Racing HD for iPad takes the top-down racer to the next level. 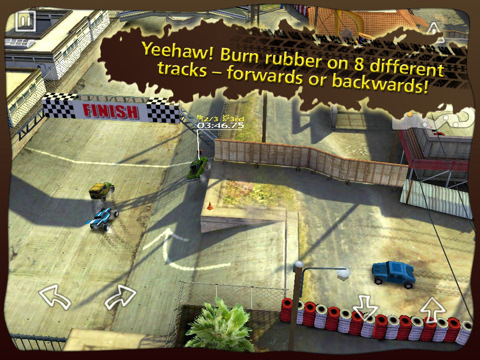 Developed by Electronic Arts, Reckless Racing HD is seriously addictive, slip ‘n slide dirt-road racing. Also available for iPhone and iPod Touch for $2.99 [iTunes Link], Reckless Racing features 5 incredibly detailed tracks, 3 single player game modes (Dirt Rally, Hot Lap and Delivery) and online multiplayer. While there are only 5 tracks, each one is also played in reverse, giving a total of 10 challenging courses to tear through in a variety of high-power rides. Every track looks amazing with running streams, intricately modeled buildings and destructible environments. There’s a short tutorial to familiarize yourself with the game and work out which one of the multiple available control systems is best for you. The game defaults to the ‘standard’ setting which simply has two pedals on the right of the screen – gas and brake, and two steering buttons on the left of the screen. If you’d rather use tilt-to-steer or any one of the other modes its easy to change. The game is based on exaggerated dirt-racing physics and the real challenge lies in controlling the extreme handling and turning the fishtailing madness into tight little turns and long sliding drifts. Once you’ve got the basics tied down you can work through each track and up the ante to earn bronze, silver and gold medals. A fully integrated online leaderboard lets you post your high scores and see how you compare with others around the world. The online multiplayer is another great feature – just tap to join a game (or host one yourself), and once there’s 4 players ready to go the game starts, allowing you to compete with friends or randoms from across the world. 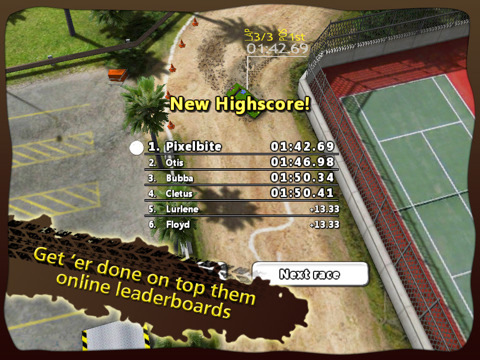 Bottom Line: Reckless Racer HD is a super-slick top down racer with a lot of replayability. 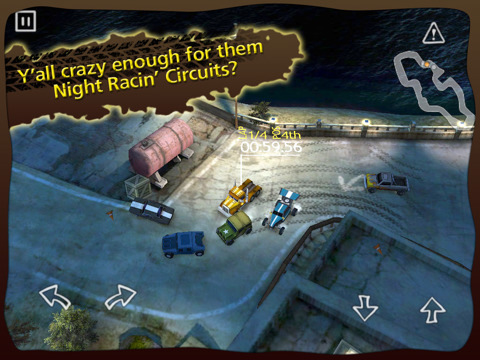 Reckless Racing HD is compatible with iPad. Requires iOS 3.2 or later.